Using what she learned as master's student in landscape architecture (LA) at ESF, Meg Johnson helped restore a national historic site the summer after her graduation. After completing her master's degree in May 2014, Johnson worked as a graduate research assistant with the ESF Center for Cultural Landscape Preservation. That created an opportunity for her to work on a project with the National Park Service. "Part of what we do is to support students interested in cultural landscape preservation and opportunities made possible through the Center's partnership with the National Park Service," said John Auwaerter, co-director for the center. "The project this summer interjected me into an ongoing effort to rehabilitate the historic vegetable gardens at the Home of Franklin D. Roosevelt National Historic Site," explained Johnson. The Roosevelt-Vanderbilt National Historic Sites, administered by the National Park Service (NPS) and supported by the non-profit Roosevelt-Vanderbilt Conservancy, consists of three parks: Franklin D. Roosevelt National Historic Site (NHS); Eleanor Roosevelt NHS, known as Val-Kill; and the Vanderbilt Mansion NHS. The Roosevelts' garden was paved for a parking lot in 1948. In 2004, when the parking lot was moved, efforts began to restore the garden. Alice Waters, the noted activist, chef and author, has been a major promoter of the porject. 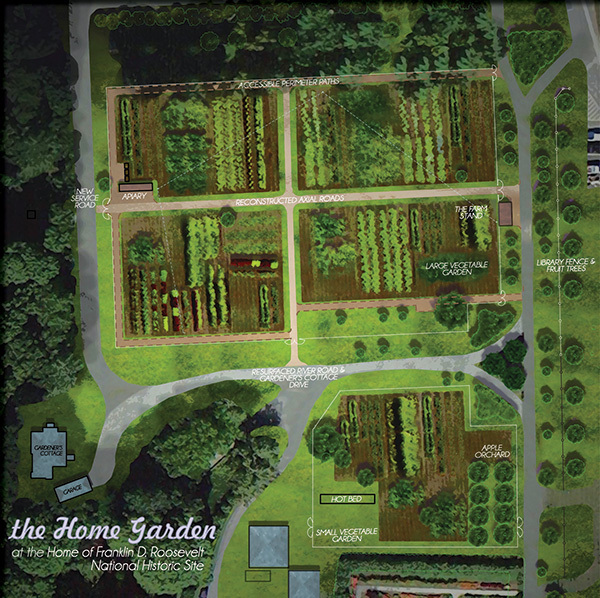 Johnson produced a rendered plan, computer-aided design plan, cost estimates and graphic illustrations of the proposed reconstruction of the Roosevelt Home Garden. "I created sets of illustrative renderings - sort of glamour shots - of the overall site, its programming, individual treatment areas and its historical narrative, to persuasively explain the mission to potential donors," said Johnson. The illustrations and renderings were needed to gain public attention and excitement, said Auwaerter. Johnson had worked with the NPS in the past, and she had previously been involved in food system projects. She enjoyed the rendering component of the internship, stating, "I've always had a great interest in representation and that sort of visual communication of complex thoughts." Johnson had an artistic background and had worked in her ESF classes on landscape preservation projects, including sustainable agriculture, according to Auwaerter. "It was very important to restore as much of the site as possible back to its historic form, per the 1946 survey, and make it as universally accessible as possible - a wonderful challenge," said Johnson. Part of the plan includes establishing a farmstand and restoring fruit trees. "They want this to be a working garden - both how the Roosevelts used it historically and also for today, using the most sustainable practices," said Auwaerter. Johnson and Auwaerter both said she was responsible for not only her design productions but also for dealing with the mix of viewpoints and balancing the different opinions of the many parties interested in the project. "In a way, I felt prepped for this layer of the work through the years of design projects in the LA department. It's quite common for stakeholders, clients and professors to give completely different feedback on the same project," said Johnson. "So in this way, it's been an effort throughout my time at ESF (and beyond) to interpret vast amounts of information and form my own hypotheses on how to best solve these design problems."